Thanks to 21st Century Cures Act requirements, private-sector innovation from companies such as Apple and many other factors, the U.S. "might be at a turning point when it comes to the adoption and implementation" of HL7's FHIR standard, according to the Office of the National Coordinator for Health IT. Nearly four year after the launch of the HL7's Argonaut Project – which convened Epic, Cerner, Mayo Clinic, Intermountain and others to create a framework to speed development and deployment of Fast Healthcare Interoperability Resources – the specification seems to be reaching critical mass, potentially pointing to huge innovations for interoperability nationwide. In a blog post, ONC's Steven Posnack and Wes Barker, said several signs point to an inflection point for FHIR, with uptake of the useful data exchange standard on the rise. All the big electronic health vendors – the 10 with the biggest market share, at least – use FHIR Release 2 as their API standard, and other consumer-facing companies have also embraced the spec, pushing its reach and possibilities even further. That progress comes thanks to several laws and policies from recent years, of course, including the API requirements in the 21st Century Cures Act and ONC's stringent 2015 Edition certification criteria. The net result, said Posnack and Barker, is that "many companies have gone into production with FHIR Release 2 profiled according to the Argonaut implementation specifications." Apple's FHIR-based client app has gotten a lot of attention, they noted, and the recent high-profile vote of confidence for HL7's Argonaut from Amazon, Google, IBM, Microsoft, Oracle and Salesforce is only building the momentum – suggesting that "many other big tech companies are also planning to use the standard." In addition, the Centers for Medicare and Medicaid Services has also amplified FHIR's reach through initiatives such as Blue Button 2.0. ONC looked closely at its own data, along with data from CMS, to assess how hospitals and physician practices accessed 2015 Edition certified-APIs, and how the trends varied nationwide. About 32 percent of developers certified to the "application access-data category request" section of the 2015 criteria said are using FHIR Release 2, Posnack and Barker noted – and almost 51 percent of developers seem to be using some version of FHIR combined with OAuth 2.0. "While the 32 percent may seem low the estimated market share of the health IT developers using FHIR is large," they emphasized – pointing to a table showing Epic, Cerner, Meditech, Allscripts and the rest of the 10 largest EHR makers all using FHIR Release 2 for their 2015 Edition certified health IT. That technology is used, all told, by 82 percent of hospitals and 64 percent of practices. "Overall, of the hospitals and Merit-based Incentive Payment System eligible clinicians that use certified products, we find that almost 87 percent of hospitals and 69 percent of MIPS eligible clinicians are served by health IT developers with product(s) certified to any FHIR version," they wrote. "When estimated for just FHIR Release 2, the hospital percentage remains the same while the clinician percentage drops a bit to 57 percent." There are still some skeptics, however. In a statement responding to ONC's blog post, Premier suggested that the FHIR-favorable headlines made in recent months by Apple, Amazon, Google and the rest are welcome – but there's a lot more left to do. While developers' coalescence around FHIR for consumer apps was promising, the government should "prioritize achieving a similar degree of development across provider facing applications," for analytics, workflow, decision support and more. As Blair Childs, Premier's senior vice president of public affairs explained: "A strict focus on consuming facing apps provides a limited view into the state of interoperability. It gives false hope of reaching the tipping point for free and unencumbered data exchange in healthcare. The reality is that we are nowhere near reaching our goal of a data-enabled health system. "Until all data is unlocked from EHRs and integrated into clinical workflows, we will continue to face walled gardens of vital information," he added. Indeed, ONC seemed to recognize some of those limitations. "While these data are encouraging, it’s not time to pop any champagne," said Posnack and Barker. "Industry-wide, much work remains from standards development to implementation." 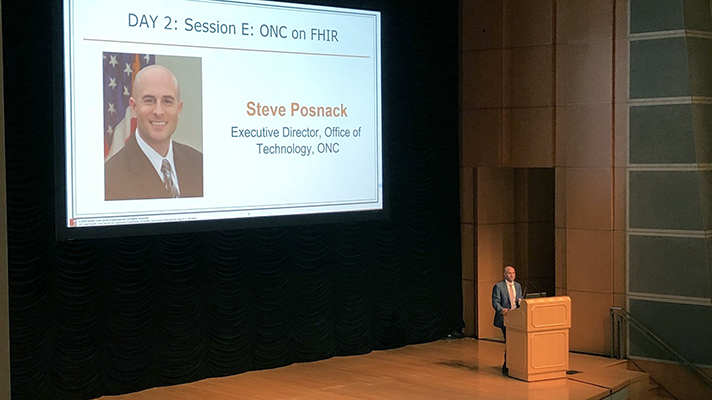 They reminded FHIR developers that "the standards community needs your help," and encouraged them to add pilot projects to ONC's Interoperability Proving Ground and tag it with "FHIR" to help fuel the agency's research.